Sorry, I thought it was finished. Mea culpa. I really like this. Excited to see how the finished product will look. This is beautiful Lorelei. I think you've done a great job of making it look similar to the picture so far. I'm looking forward to seeing how you do the rest of this. Looks very, very beautiful. I love the perspective you've chosen. I have three suggestions, that might make your artwork look even better. The first one concerns the island with the Adwoa Ruins: There seems to be a bit of blue underneath the black line belonging to the hill symbol on the right side of the island (where the two trees are). Maybe you could alter the coastline of the island a bit so it fits with the symbol? Also, due to your choice of perspective, one can see the coastline of the island rather well. Because of that, I would suggest adding some sort of coastal environment (beach or cliff). Maybe you could even make it go under water a bit? The second suggestion concerns the area left of the order of the first monastery: The horizon seems to be a bit lower on this side of the image, than on the left side. Maybe you could add some (semi transparent) mountains to even it out? If you've made this on purpose, because the terrain is supposed to be lower on this side as it seems to be the case on the photo, you could still add an entity that gives an impression of the lands that lie beyond the hills (as in the photo). And the third concerns the tree size on the far end of the lake: The trees on the left hand side are larger than the ones on the right side, even though they are higher up in the picture, which does indicate that they are further away. Maybe you could rescale either of them? As said, I really like your artwork. The suggestions are criticism on a very high level and concern nothing but details. If it would be too much trouble to implement them, the map still looked great without them. This is so amazing - like a labelled photograph. Love how great that looks. Question about your font. Is this provided with CC3+ or an add-on? If not, most users of your map will just see a plain replacement font. While not critical, it will take away some of the feel. 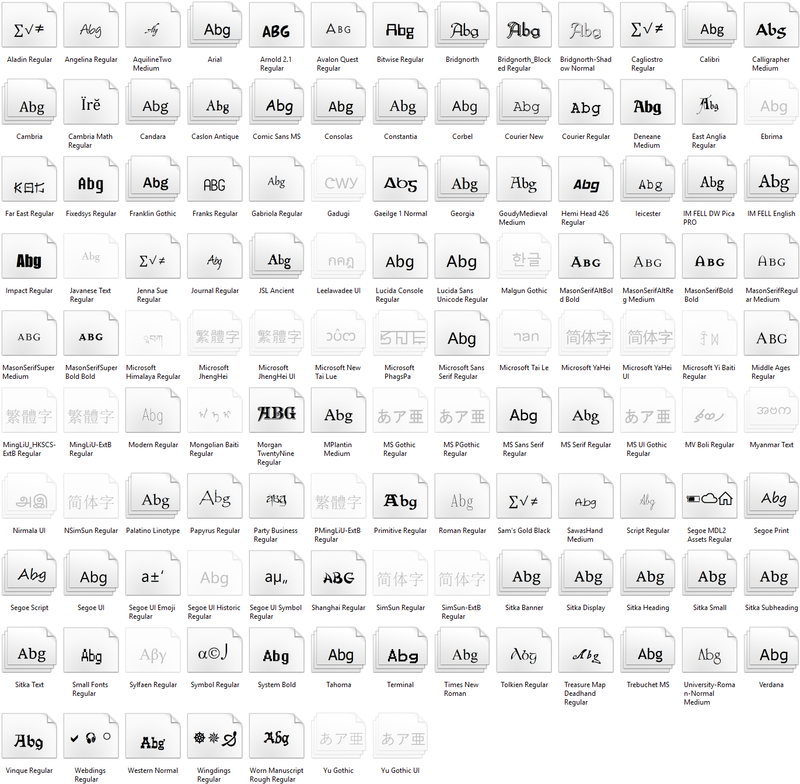 I don't have the actual list of fonts installed by CC3+ (and add-ons), but this image shows all the fonts installed on my "atlas" computer. This is a clean setup almost without any kind of software except for CC3+, all add-ons, and some basic tools I use to maintain the atlas. If it isn't in this list, the normal CC3+ user won't have it. If it is in this list, there is a good chance they will have it. Lorelei's map is now in the Atlas. Thanks for contributing. I think that even the witch doctor would agree that your juju is powerful with this map. wow!!! This is absolutely stunning! Which annual is Da Rust style in?